These match the Bensonhurst bedspread and they are well made. I am giving it 4 stars because they do not fit snug on a king size pillow. They are about 2”-3” too long. I will live with it but would rather the pillow fit snug in the sham. 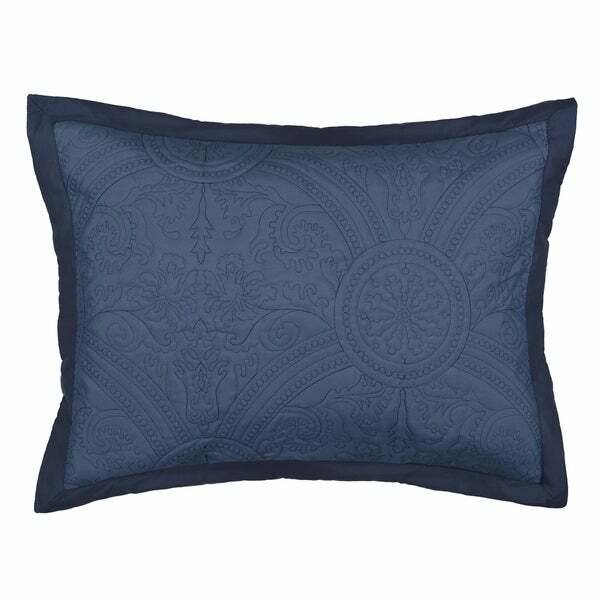 The Bensonhurst pillow sham coordinates with the Bensonhurst comforter set, bedspread and accessories bedding group. These fit my pillows well. The wrinkles fell out before I had a chance to wash them. They look really good on the bed, showing the darker navy trim. Happy with my purchase. The shams look great with the matching comforter! Good match to spread. My only complaint is that it should have been included with spread for the price. Spread was over *** and the shams were half as much. Decided to bite the bullet because everything matches and looks good on the bed. Good finishing touch on the bed. I chose this product to compliment a quilt my mother-in-law made for my wedding. I like the quilted pattern on these shames.